International Women’s Day (IWD), originally called International Working Women’s Day, is marked on March 8 every year. In different regions the focus of the celebrations ranges from general celebration of respect, appreciation and love towards women to a celebration for women’s economic, political, and social achievements. Started as a Socialist political event, the holiday blended in the culture of many countries, primarily Eastern Europe, Russia, and the former Soviet bloc. In some regions, the day lost its political flavor, and became simply an occasion for men to express their love for women in a way somewhat similar to a mixture of Mother’s Day and Valentine’s Day. In other regions, however, the political and human rights theme designated by the United Nations runs strong, and political and social awareness of the struggles of women worldwide are brought out and examined in a hopeful manner. 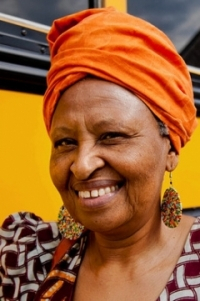 If you go to the Home Page, you can read more about Mama Kamau and her passion to help other African immigrants, because when she came to the US, she had no such organization to help her. This ingenious idea of using the income from the greenhouses in Africa to help African immigrants come to America and adapt to life in these United States is one that helps both the African farmers and the African immigrants is a wonderful concept. So I salute my friend Wanjiru Kamau inInternational Women’s Day, because she has demonstrated that one person can make a difference in the lives of many. The woman I am sponsoring is a victim of war and lives in Rwanda. Her name is Flavia and she has one child to support. 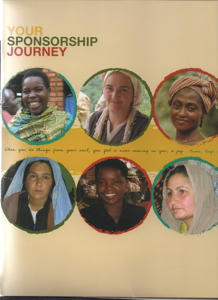 The cost for one year of sponsorship/ training is $360, plus $30 to set up the sponsorship. I chose this organization, because I wanted to have a one-to-one relationship with our money. When I send in a check, I write a note, which is translated for her. As a result of war and conflict, women often lose everything that ever mattered to them, including their sense of self. Their voices are silenced. And even if they were to speak, there is no safe place where they can voice their pain. To learn more about Women for Women International, click on this link: www.womenforwomen.org. If you wish to help me sponsor Flavia, because I have not collected enough for the whole year as yet, feel free to email me at: menupause.info @gmail.com for more information. 3. Footprints Foundation – www.footprints-foundation.org/– The third organization was started by Lorna Owens. We met on the cruise ship last month from Florida to the Bahamas. (Lorna is originally from Jamaica,but lives in Miami) and I was impressed with her calm sense of purpose and gentle “aura.” I asked her for more information and she sent me a brochure about her organization as well as her book, Everyday Grace, Everyday Miracle: Living the Life You Were Born to Live. It is autobiographical and very spiritual, because she was drawn to do this instead of remaining at her career as a lawyer. 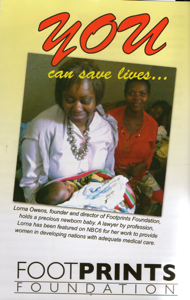 Footprints Foundation is dedicated to reducing the mortality rates of infants and mothers through medical treatment and midwifery. The Foundation will operate in 58 countries, including the Democratic Republic of Congo in Central Africa, Liberia, Jamaica, and Turkey. Lorna’s book is published by Blessings Press in Miami, FL. The cost is $14.95 and you can reach Lorna to order a copy at: www.lornaowens.com. Thus, what FINCA does is make microloans to otherwise destitute women to enable them to start or expand their tiny businesses. This will help them to become financially independent because they will be earning a steady source of income. The powerful gift of a small loan, as low as $25, can change everything for a poor working mother. Fell free to contact them via the FINCA website for more information. P.S. Some people celebrate this day by wearing a purple ribbon. No ribbon? Just wear a purple blouse or T-shirt or purple scarf. This entry was posted on Thursday, March 6th, 2014 at 10:54 am	and is filed under Profiles. You can follow any responses to this entry through the RSS 2.0 feed. You can skip to the end and leave a response. Pinging is currently not allowed. Greetings to all women for Women’s History Month.